Q’Straint opened a new state-of-the-art research facility exemplifying the company’s leading edge innovation in advancing the safety and effectiveness of wheelchair passenger travel. The iQ Research Center of Excellence will push further innovation and enhance the company’s product development capabilities. The facility features state-of-the-art technologies such as a HYGE crash simulation system and Phantom high-speed cameras to help study the dynamics in a crash environment as they relate to wheelchair passengers. The new iQ Research Center of Excellence and crash simulation system are located in Q’Straint’s Whitstable, East Kent, U.K. location. 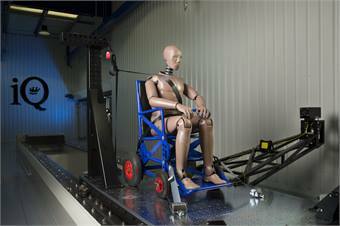 Currently only a limited number of HYGE dynamic crash simulation systems exist in the world.